Choose the recorder by the factors. If you don't find the recorder you need, contact us. Multiple GigE and USB3 camera ports, fanless cooling, small footprint ruggedized casing for space-limited, hostile environments, and powered by a mobile-class embedded 3rd generation Intel Core Processor. Matrox 4Sight GP is supported by the Matrox Imaging Library (MIL)2, a comprehensive collection of software tools for developing industrial and medical imaging applications. MIL features programming functions for image capture, processing, analysis, annotation, display and archiving. These tools are designed to enhance productivity, thereby reducing the time and effort required to bring your solution to market. Refer to the MIL datasheet for more information. Matrox 4Sight GPm with Design Assistant is a line of rugged, capable and configurable vision systems for rapid development and deployment onto the factory floor without the need for conventional programming. Equipped with up to four Gigabit Ethernet ports with power and up to four SuperSpeed USB ports, Matrox 4Sight GPm supports the use of multiple GigE Vision® and USB3 Vision™ industrial cameras to keep an eye on one or many production lines. Powered by a range of mobile-class embedded Intel® processors, it has the ability to cost-effectively handle typical multi-camera inspection applications. It can easily directly connect to factory automation equipment and enterprise systems through discrete I/O, Ethernet, RS232/RS485 and USB ports. An industrial-strength design and careful component selection ensure its long term availability. Matrox Design Assistant is used to put together solutions for the agricultural, aerospace, automotive, beverage, consumer, construction material, cosmetic, electronic, energy, food, flat panel display, freight, machining, medical device, paper, packaging, pharmaceutical, printing, resource, robotics, security, semiconductor, shipping, textile, and transportation industries. Matrox 4Sight GPm is an industrial computer built for machine vision on the factory floor. A fanless design with multiple ports for GigE Vision® and USB3 Vision® cameras make the Matrox 4Sight GPm right at home in any production facility. Powered by a mobile-class embedded 3rd generation Intel® Core® processor, Matrox 4Sight GPm has what it takes to cost-effectively handle typical multi-camera inspections. Comes in three different CPU options. Matrox 4Sight GPm is equipped with four Gigabit Ethernet and four SuperSpeed USB ports for connecting to the full range of available GigE Vision® and USB3 Vision® cameras. The Gigabit Ethernet ports support Power-over-Ethernet (PoE) to further simplify cabling and thus reduce costs when opting for suitable GigE Vision® cameras. Powered by a mobile-class embedded 3rd generation Intel® Core® processor, Matrox 4Sight GPm has what it takes to cost-effectively handle typical multi-camera inspections. Matrox 4Sight GP is a high-performance embedded system for image capture, processing, display and I/O that features an embedded 3rd generation Intel® Core™ processor, Gigabit Ethernet and USB 3.0 interfaces, and PCIe® 3.0 expansion. 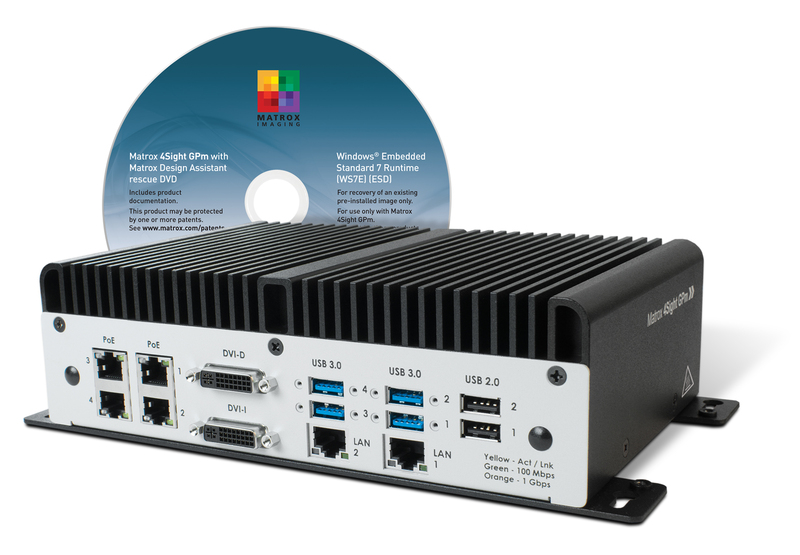 The Matrox 4Sight GP offers desktop-level performance—including real-time high-definition H.264 encoding offload—in a small ruggedized enclosure and is ideally suited for tough environments. 4Sight GP comes in three different CPU options. Matrox Supersight Solo is an entry-level configurable single-node high-performance computing (HPC) platform supporting two multi-core Intel® Xeon® processors, third-party GPUs and Matrox FPGA boards for demanding industrial imaging applications.